Conception II: Children of the Seven Stars for Nintendo 3DS requires you to have a lot of Star Children to go into battle for you. You are able to bring nine of them with you into battle, and you will be setting them up in teams with three to a squad. You will be constantly producing Star Children, and with that in mind you are going to want to know what classes are available to produce the best possible teams. In this news reveal for Coneption II: Children of the Seven Stars, we are going to be taking a look at 8 newly revealed classes: Archer, Blacksmith, Bondsman, Diva, Gun Saint, Lancer, Merchant, and Ranger. Inside you will find screen shots of each class, a brief example of what stats could look like, and a explanation detailing their roles in battle. You are going to need Star Children within this game to fight for you, which you are able to bring up to nine of them into separate teams of three. You are going to be making Star Children with your heroine of choice, but it is best that you have a strong bond with her first. Also, you are going to have to make sure that once you produce Star Children that they have the proper classes to support them so they are not annihilated in the Labyrinths. The reason it is important that you know about the game’s heroines and stay on their good sides is that their individual stat strengths determine the type of Star Children they can produce. Feene, for example, excels in defensive stats so she is naturally capable of producing Paladin units (Heh, guess that unit will be revealed a bit later, right?). In total there 30 Star Children classes you can pick from! With this in mind, you better pick the right heroine before heading into the Labyrinth because you will be doing a lot of stat balancing. To make things even more complicated, the teams composed of the same type of Star Child can deal out extra damage, but this can also mean your entire team is vulnerable to the same things. Better make sure you experiment to find the perfect teams. 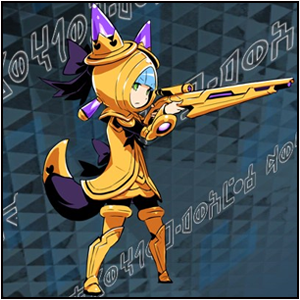 The last time we got to check out 6 of the 30 classes available for Star Children in Conception II: Children of the Seven Stars: Cleric, Magic Knight, Thief, Minstrel, Swordis, and Warlock (View the post here). This time, we are being greeted with 8 new ones: Archer, Blacksmith, Bondsman, Diva, Gun Saint, Lancer, Merchant, and Ranger; this brings the total up to 14 revealed thus far! Each of these Star Children possess different abilities and talents to help out, you can check out their picture, sample stats, and detailed battle use below. This early-to-mid game unit excels at hitting weak points with bows and tricky movement. Archers are good attackers that can add effects to their attacks, be it debuffs, status conditions, etc. This master of weaponry can wear down opponents with repeated smashing. Can break enemies’ defense, and shatter enemy power. They’re a fairly powerful unit to acquire early game, but drop off in mid-to-late game. With dapper hats and tuxedo outfits, Bondsmen are late-game units that require maxing out your relationship bond with their mother. They wield lances and unlike most other units, they use Bond Points for their magic attacks and heals instead of mana. This pop idol-like musician is a stronger version of the minstrel. This support unit requires an extremely rare item to create. But in addition to buffing allies and debuffing enemies, she can also revive her teammates. Take a paladin, give him a gun, and you get a Gun Saint. This late-game unit requires a special rare drop, but with gold armor and a powerful weapon, the GS can penetrate any armor. Strong attacking class that excels at building Chain gauge quickly to help immobilize units. Deals an incredible amount of damage in the right team composition, and are available mid game. This early game unit is great for wheeling and dealing, as well as axing monsters right in their face. In addition to strong attacks, Merchants also have the ability to summon a shop to buy or sell items, in case you find yourself mid-dungeon without enough health or mana potions. Rangers are quick to adapt to a multitude of roles within a party. They have effective heals, and debilitating debuff attacks. Their defense also allows them to be solid protectors. Rangers are a good mid-game choice for all but the most specialized parties. The more that I see this game, the more I want it! The fact that all the children are adorable and the classes appear fun is more than enough for me to salivate at the thought of it…well, maybe not salivate but still, it is damn good. I have not really ever been a RPG guy, but this game right here makes me want it more than anything. As more children are revealed, I will make sure to keep update you as soon as I know. Be sure to stay here for all coverage of Conception II: Children of the Seven Stars for the Nintendo 3DS!